Fake news websites have cited multiple Twitter accounts likely run by Russian operatives in articles they’ve posted, undoubtedly helping the accounts’ backers sow discord in the United States. On October 17, the Russian publication RBC published a report on the Internet Research Agency, a Russian firm tied to the Kremlin, and how it impacted the 2016 election via social media platforms. Included in that report were the usernames of multiple Twitter accounts that these operatives used, the most prominent being @TEN_GOP. 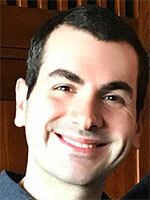 Other publications have also reported on other Twitter and Facebook accounts that these operatives used. Twitter will reportedly tell Congress that it has since discovered 2,752 accounts linked to the Internet Research Agency. Hyperpartisan websites known to push fake news have repeatedly cited some of these accounts in their articles (specifically @Pamela_Moore13, @USA_Gunslinger, @10_GOP, @Crystal1Johnson, and @Jeblary2016), as the accounts’ tweets can align with these websites’ agendas, and the pieces have then been shared on social media. 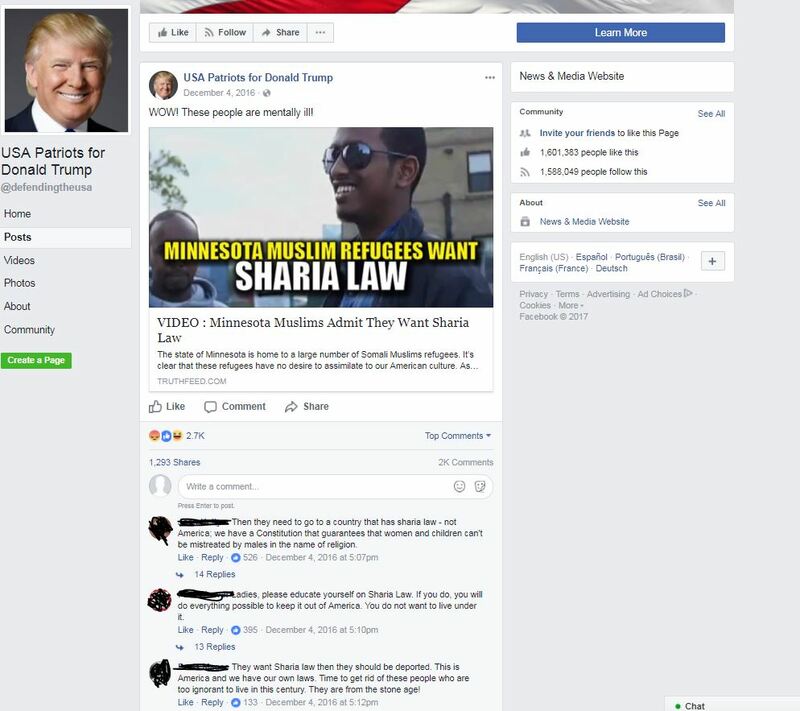 Last December, multiple fake news websites cited a claim from the account @Pamela_Moore13 that Minnesota Muslims “want Sharia law.” Facebook users then shared the articles, with some commenters demanding that the subjects “be deported” and claiming that they “DO NOT BELONG IN THIS COUNTRY.” Combined, those articles received over 20,000 Facebook engagements, according to social media analytics website BuzzSumo. A fake news website also cited the @Pamela_Moore13 account to attack Starbucks for promising to hire refugees, and the piece was also shared on Facebook and Twitter. Fake news websites also prominently cited these accounts to praise or defend President Donald Trump, with the pieces shared on social media. A fake news website cited a comment from the alleged Russian account @USA_Gunslinger that “this video of crowds in Poland cheering the arrival of @realDonaldTrump makes me so proud to be American” to claim that Poland was “ecstatic” for Trump to visit the country. Fake news websites also cited @Pamela_Moore13 to defend Trump’s mass firing of U.S. attorneys in articles that were then shared on some Facebook pages. Such sites also cited the account to push Trump’s false claim that Trump had wiretapped Trump Tower. Most often, these alleged Russian accounts were employed to attack Trump’s perceived enemies, with the results again being shared on social media. 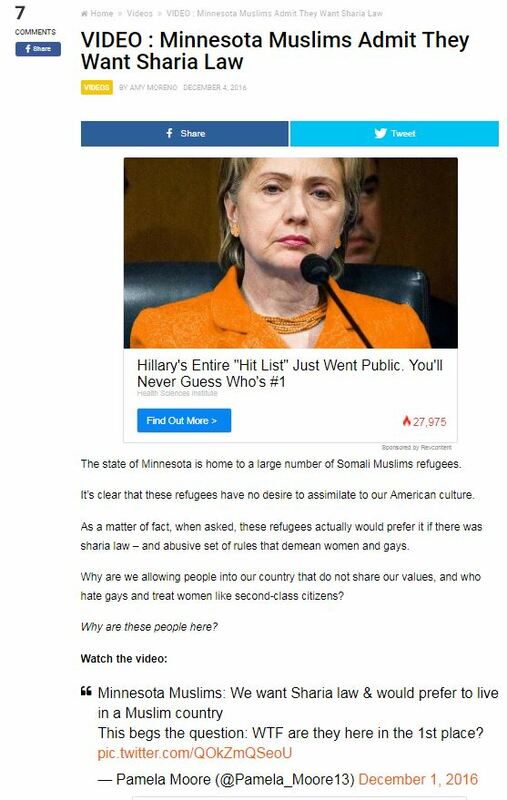 Fake news websites and others websites cited one of the accounts to accuse former Secretary of State Hillary Clinton of colluding with Russia and to claim that Rep. Maxine Waters (D-CA) (already a target via @TEN_GOP) wanted Sharia law and had attacked former FBI Director James Comey. They also targeted former President Barack Obama, citing the same Russian account to claim that Obama tried to sabotage Trump, and used that same account to accuse former national security adviser Susan Rice of “felonies.” YourNewsWire, a fake news website accused of being a Russian proxy, cited that same account to attack former Clinton campaign chairman John Podesta. Some of these articles received thousands of Facebook engagements. Attack the press, going after CNN for supposedly cutting off an official from Puerto Rico during an interview because the official criticized someone who has criticized Trump, and for supposedly suggesting that only Democrats prayed at the congressional baseball game held for Rep. Steve Scalise (R-LA) after he was shot (that article was pushed on Facebook by Fox News contributor Herman Cain). A website also cited one of the alleged accounts to call for Fox News anchor Shepard Smith’s firing. Push unverified information about the Las Vegas mass shooting, citing alleged Russian account @10_GOP (not the same account as @TEN_GOP). Play up chaos regarding race relations in the United States, citing alleged Russian account @Crystal1Johnson to claim that “we live in a police state” and @10_GOP to hype a protest in St. Louis, MO, after a police officer was acquitted of murder. Claim that a “liberal website” wanted to “stab” Trump supporters, attack actor Johnny Depp for seeming to call for Trump’s assassination, and attack a Democratic congresswoman for not participating in a moment of silence for the Las Vegas mass shooting. Combined, these fake news websites' articles citing alleged Russian accounts had at least 140,000 Facebook engagements, according to BuzzSumo. Non-fake news websites also cited some of these alleged Russian accounts, along with other alleged Russian accounts @tpartynews and @lgbtunitedcom. Far-right blog The Gateway Pundit repeatedly cited @Pamela_Moore13 to hype a Trump rally in North Carolina, defend Trump’s firings of U.S. attorneys, identify a supposed Muslim gunman, and compare Democrats to ISIS. Another outlet, the conspiracy-minded Infowars, cross-posted pieces citing @10_GOP to hype the St. Louis police protest and @Pamela_Moore13 to push a hashtag calling for the firing of Trump aide and son-in-law Jared Kushner. Other outlets that cited these alleged Russian accounts included Breitbart, The Blaze, RedState, the Washington Examiner, Fox News (multiple times, including a Fox News columnist retweeting one of the accounts), The Telegraph, The Washington Post, Vox, HuffPost, and The Associated Press. 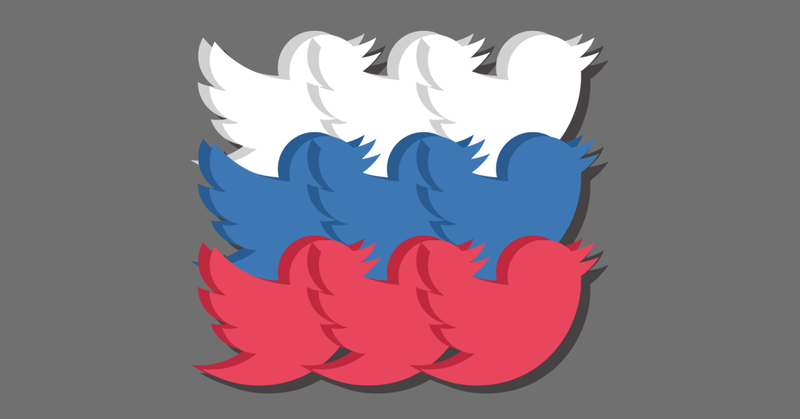 It's obvious that hyperpartisan websites acted as a multiplier for the influence of these alleged Russian accounts, as they did with @TEN_GOP, giving them a reach they may not have had otherwise and thus aiding the Russians’ likely goal of ensuring tumult in the country.